“You came here to hear the Psalms?” Mrs. MacKenzie asked as we were checking in to the B&B. She sounded genuinely surprised. My wife Lynda had learned of this cultural event years earlier when she studied at the University of Edinburgh, and we had traveled to the Isle of Lewis to attend a church service and hear people sing in Gaelic. Lynda had played me a recording, and I was not as taken, but the Isle of Lewis looked interesting with the Callanish Stones as a secondary point of interest. Mrs. MacKenzie’s tone made me think that perhaps the Stones would become the highlight rather than the consolation prize, and there was always the rest of our trip through the Highlands. We had rented bicycles in Ullapool, Scotland, taken a ferry, and ridden to Mr. and Mrs. MacKenzie’s Bed and Breakfast in Stornaway as our base. The next morning after an excellent Scottish breakfast, we biked over to the Free Church Seminary, as recommended by our hosts. Donald and David greeted us at the door, and we quickly noticed that our attire did not exactly fit in. Women wore black dresses with mostly black hats, the only color coming in the form of a ribbon. Lynda, on the other hand, was wearing pants and a long-sleeved t-shirt—perfect for cycling, perhaps less perfect for a conservative Free Church meeting. My attire was closer to the norm but more colorful and casual than the other men. Despite our dress, the parishioners were extraordinarily friendly, even pointing out where we were in the Gaelic bible passages. We smiled and tried to follow along despite having zero comprehension. The entire service was in Gaelic, a possibility that somehow had not occurred to me beforehand. But between readings and after a sermon, the singing voices were unbelievable and otherworldly; my rough description is something like being in a bagpipe with the church as bag and voices as notes. I don’t have a better analogy. It was powerful and like no music I have ever heard. A man called the Precentor sang a verse, and the entire congregation sang it back, but not in the same tone or melody. The followers’ voices rise and fall out of sync so there is continuous relatively high volume. This experience blew away my expectations, having found something so unique and amazing and sharing it only with the congregation and seeing no other tourists. These locals, surprised at our presence, said no one typically visit for this purpose. Attending the service also led to another traveler’s dream, a generous invitation for a lovely Sunday dinner with a local family – the Precentor, his wife and children. We left our bikes at the church and rode in their car to their house, where we learned that Gaelic was the children’s first language. With age they transitioned from speaking better Gaelic and struggling to find English words to not speaking Gaelic at all because it was not popular at school. If this sounds hard, it was apparently an improvement over a time when teachers would strictly discourage speaking Gaelic at all. The children were lively and engaging, making us laugh throughout the dinner with small jokes and a descriptive exclamation about a teacher from the five-year-old… “Och! She’s huuuge!” The family even offered the use of their car to go to the Callanish Stones when they learned that we planned to ride our rental bikes there in weather that was looking ominous. We declined in order to keep our travel in the cycling spirit. 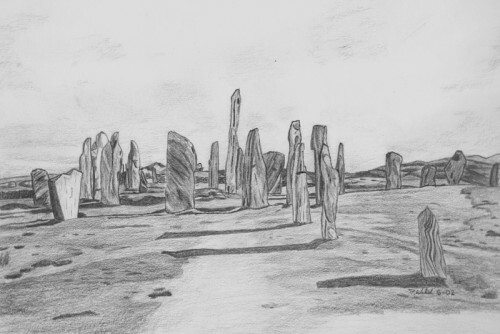 After a short car ride back to the church, we changed and began our bicycle ride out to the Callanish Stones, 7 ½ rolling miles on pavement through grassy hills and peat farms. We saw a red deer, which was surprising to our hosts when recounted later that evening. A light drizzle, typical for the Scottish Isles, stayed with us the entire way, and the wind was mostly at our backs except for the last mile, which turned directly into it. To our delight, the sun came out while we tried to dry our socks and snacked. There were few people visiting the stones that day, but a German man agreed to take our photo as long as we stayed out of his way while he photographed the area. The white and gray stones appeared delicate and almost ghostly, a great contrast to better known stone circles like Stonehenge. The late afternoon sun cast long shadows from each stone, and we departed as the sun went back behind the clouds. The ride back to town was challenging, now with a gustier headwind and falling temperatures, the uncomfortable rented bicycle seats reminding us why we seek the perfect saddles on our home bikes. We were very excited to see the stone Memorial Tower at the top of the hill above Stornaway. Lynda quipped that the Yoga position called Lotus must have been invented after someone biked too far in the cold, using their feet as icepacks for their hot, sore quads. We enjoyed long, hot showers and fell asleep early, settling for Chinese takeaway and only slightly wishing that conservative Stornaway had more restaurants open on Sunday evening. We explored Stornaway on Monday, enjoying a sunny morning and talking to shopkeepers. Again, the typical Lewis friendliness embraced us: we barely escaped one woodworker’s shop in time to catch our ferry. The owner taught us a lesson about local life, voicing his opinion that “good land makes good people” and his sadness that so many young people were leaving Lewis to find work in Glasgow and elsewhere. But it was time for us to leave, too. We talked about the powerful Gaelic voices and dreamed about a more extensive bicycle tour the entire 2 ½ hour ferry ride back to Ullapool and over glasses of port in the cozy upstairs lounge of the Ceilidh Place Hotel. This 2 night tour of the Outer Hebrides was the true beginning of my bicycle touring habit, the Gaelic Psalms still haunting the experiences of my travel.